Before power hand tools, men all around the world walked around with scabs, cuts and bruises on their hands. These tools save time and physical effort --- as well as your skin. A plethora of power tools are available in local hardware stores, most having several functions. Some of the most popular power hand tools on the market include power drills, electric saws and sanders, as well as nail guns. Power tools will often get the job done in half the time. Typically used to bore holes in almost any type of surface, an electric drill is one of the most common power hand tools used by do-it-yourselfers. Drills are highly versatile and can drill almost any type of surface, usually only requiring a change of the bit to fit the job at hand. Some electric drills have a pneumatic function that "punches" through the surface while drilling at the same time, making it easier to drill hard surfaces. Drills transform into electric screwdrivers as well since some bits are designed to fit almost any type of screw. Like typical manual saws, circular power saws cut through wood and other materials, as well as some metals. As with drills, you must fit a circular power saw with a specific blade designed to cut specific materials. Circular saws have an on and off switch usually located at the handle, an arbor nut securing the blade and a safety guard protecting the user from touching the spinning blade. Sanders smooth out surfaces made of wood, marble and a few other types of materials. Several types of sanders exist today; one of the popular types is the "random orbital sander" This handheld power tool spins a sanding disk in an elliptical form, allowing a finer finish because the sander never travels the same path. Power sanders come equipped with sandpaper disks that vary in thickness and grit. Some random orbital sanders have variable speed control and a dust collector. Hammering a single nail where you can hang a family picture is easy enough that you can use a typical hammer, but when you're about to build a house or a shed, getting a nail gun will save you time and effort. 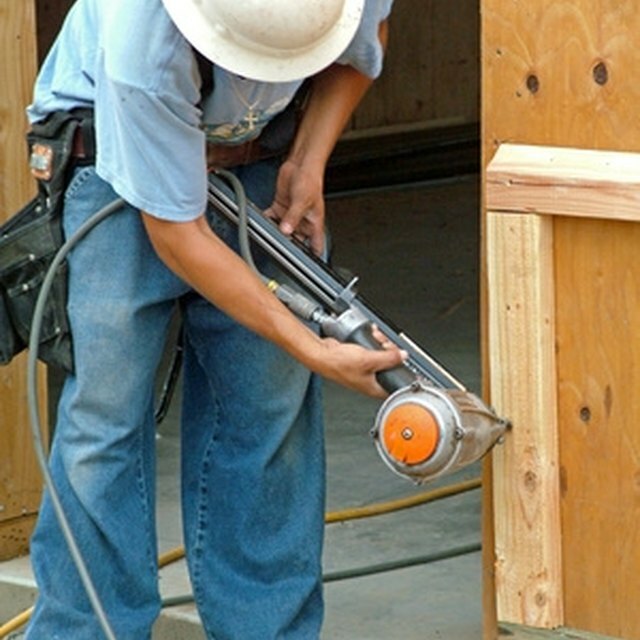 Nail guns are commonly powered by compressed air, electromagnetism and even flammable gases. They also use specially designed nails that come in clips or cartridges. What Is a Metal Nail Made of?